Rehabgadgets2go’s recent post “Tip: Stylus Saves the Day” provided a stylus solution and other stylus options for individuals with a mobility impairment. A stylus can be a make or break solution to accessing a tablet, or touch screen cell phone for individuals with mobility impairments as well as for the aging workforce whose finger dexterity may somewhat challenged. Here is another stylus “to the rescue”, the iPad/Tablet HandPointer ($29), produced by RJ Cooper and supplied to me by Phil Dellegrazio, Manager of Environmental Control Solutions at Adaptive Technology Resources (Thanks Phil!) 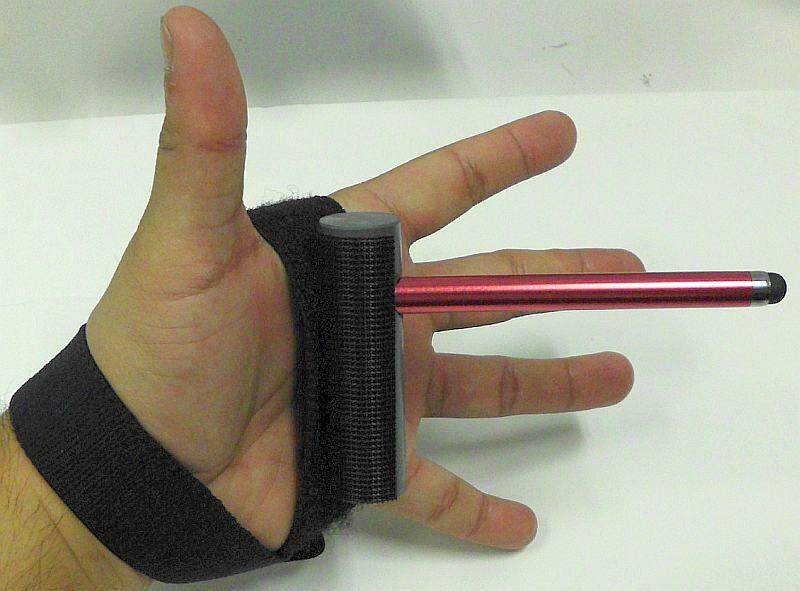 who needed a stylus for a client with quadriplegia. I found this stylus strap to be very comfortable and stable as it is made from elasticized loop velcro. The strap is well anchored with the cross over style method of application. Heavy duty velcro on the cylinder that the stylus is mounted in allows it to be solidly attached, adjusted in position and stable within your hand. The elasticized strap allows it to conform to the velcro on the cylinder base providing more stability to the stylus position. Below is RJ Cooper’s instruction of application of the strap. The strap can be easily cut to size as needed and can be used for left or right-handedness. 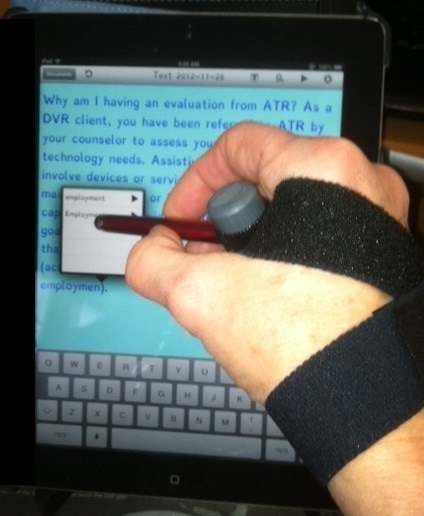 The iPad/Tablet Stylus from RJ Cooper is a good stylus option that is adaptable to individuals with mobility impairments. Thanks to Phil at ATR for supplying me with this adaptive device for my AT or OT iTool Kit! This entry was posted in Accessibility, Accessories, iPod/iPad Accessory, Mobile Device Use, Mobility Impairment, Stylus and tagged Accessibility, accessories, Android, iPad, iPad accessories, Mobility Impaired, occupational therapy, Stylus. Bookmark the permalink.